A product normally carries several pressure ratings, and each have to be verified either in development or in a production environment. Pressure Range – The pressure range values in which the product is intended to operate; indicated by lower and upper limits. 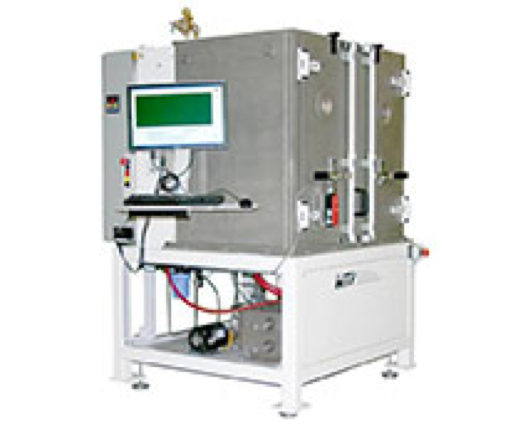 Pressure range testing is generally completed on a Flow Bench, ATP Test Stand, or Development / Life Test Stand and is normally performed while the component is in operation or an operational environment. Therefore, we rarely encounter Pressure Range Testing being completed on a Proof or Burst pressure Test Stand. Proof Pressure – This is the maximum pressure that can be supplied to a product without causing permanent damage to its operational function. Sometimes it’s expressed as “over-range capacity” and can be rated for a specific pressure limit or as a multiple of the upper pressure range value. Proof pressure testing simply supplies the component under test with an increasing pressure until its pressure rating reached and then held for a period of time. In some component testing this may also incorporate product fluid leak measurement and expansion measurements. Burst Pressure – This is the upper limit of pressure which can be applied without catastrophic failure of the component. It’s expressed as maximum pressure or as a multiple of the upper pressure range value. In hydraulic equipment this value can be as high as 6X or 10X the maximum operating pressure. Burst pressure testing simply continues to increase the pressure, beyond the proof pressure, until the component fails. These test pressures can easily reach 20,000PSI and even high as 60,000PSI. As proof and burst testing is not done on a daily basis, other than in production end-of-line testing, these test stands can sit unused for days at a time. Today’s market trend is to combine pressure testing into other use stands. 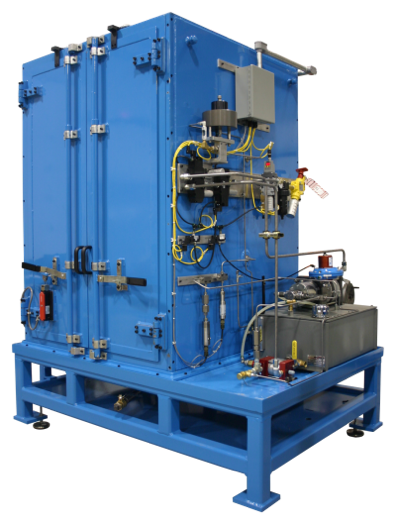 There can be a substantial cost savings to add proof or burst testing capabilities to an Impulse Test Stand, an ATP test stand, a Flow Bench, or any type of fluid power test stand. This may be a simple as adding additional components or a stand-alone test station. The reduced cost of eliminating a stand-alone test frame, fluid power source, electrical controls, and data acquisition (DAQ) system on a combined test stand has advanced this practice in today’s stands. Reduced power consumption and floor foot-print / space requirements are also a driving factor in this trend. While combining stands is common, there are several factors to consider before doing so. These include how will the component react during the burst event, will there be projectiles and what are the maximum possible weight (ballistic effects), and can the test be preformed with the stand’s normal operating fluid. Some burst test stands require sand-filled double chamber walls to contain the product during failure. A manually operated system generally requires the operator to hand operate a pump to increase the pressure. The pumping is continued, while a pressure gauge is monitored, until the desired pressure or failure is reached. 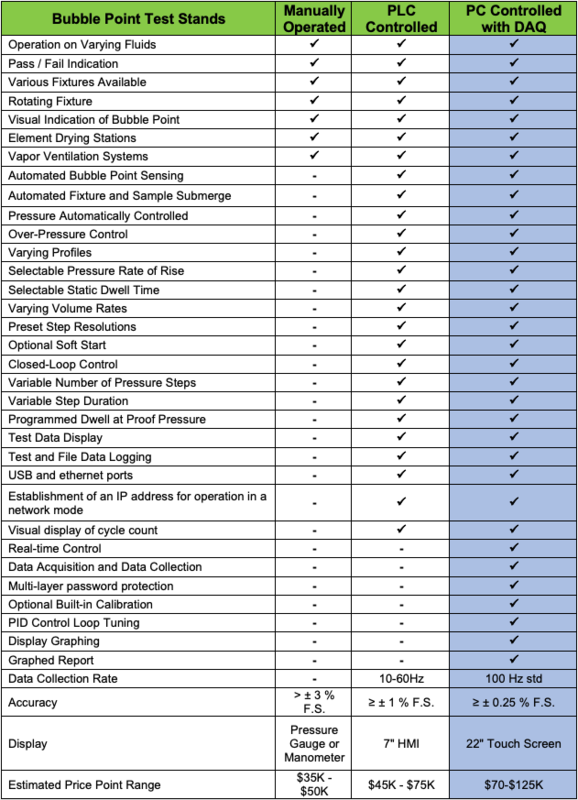 A PLC based system can provide automatic ramping, and pauses, of the pressures as desired. The test pressure is swept or stepped upwards until the desired test pressure or a component failure is reached. 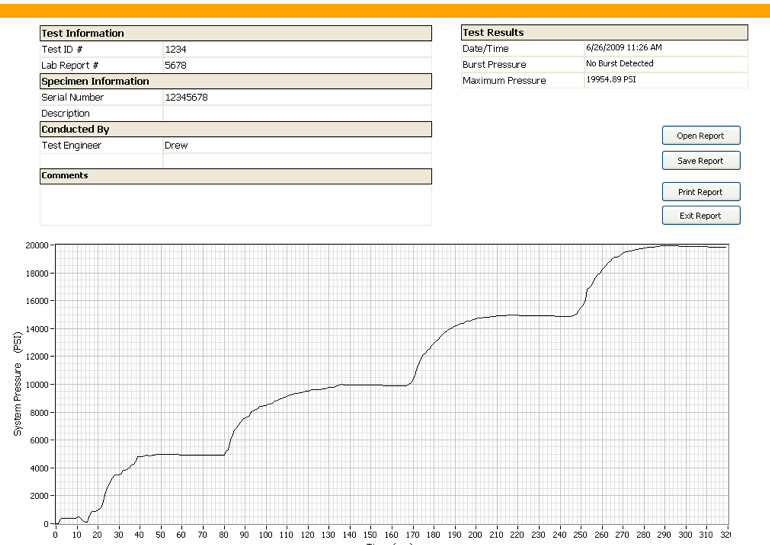 The pressure is then displayed / recorded to complete the test. System accuracy is improved over a manually operated stand as the rate of pressure increase is refined and the pressure is electronically recorded. Real-time PC based systems provide the highest accuracy as the pressure sample rate is much greater. This type of system can drastically reduce test times in production rate environments. In addition, product expansion can be monitored across various pressures indicating that a failure is approaching and can be used for product evaluation without requiring an actual failure event. Tests can be automatically repeated comparing the results and component volumes. Test parameters are automatically recorded, documentation developed in report format, and graphed after the test. The test results, depending on the component test specifications range from simply the “last viewed” pressure on a pressure gauge and then recorded by the operator to fully graphed and compared, test-to-test, with several parameters. These requirements must be done manually on a basic stand but can be automatically generated on the upper level test stands. The following overview gives a “rule-of-thumb” outline of general offerings available in today’s marketplace and not intended to capture all of a Proof and Burst system’s capabilities, manufacture’s offerings, or limitations. 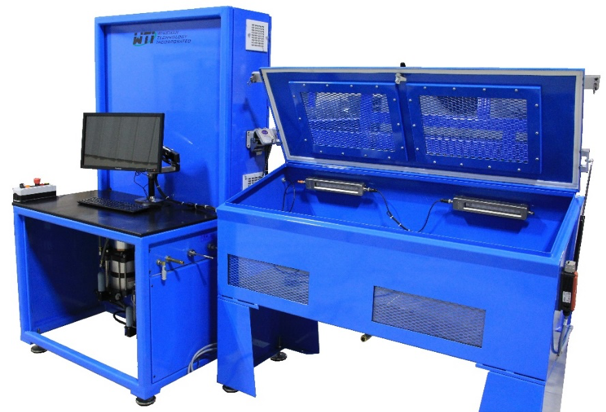 Wineman Technology specializes in providing only high-end burst pressure test systems complete with a PC based control and full data acquisition systems. Semi-automatic or fully-automatic systems are available with varying options to fully meet your testing requirements. Our systems are engineered per application, not an off-the-shelf system which you have to adapt your test requirements to meet the stand’s capabilities, as to provide the best solution for your testing requirements. Wineman Technology’s engineering application team can provide a system requirement analysis to help you determine which system level best meets your testing requirements including defining a system to meet both your current and future lab testing life cycles. As always, we welcome any comments on or suggestions regarding our blog articles to better support our customers’ requirements. For more information on fluid power based test systems, please contact Wineman Technology for detailed specifications or quotations to meet your testing requirements today.